Amatrol’s Programmable Logic Controller (PLC) Learning System – Siemens S7 (87-IOSS7) allows learners to practice PLC operation, programming, and simulation with either a Siemens S7313 or Siemens S7314 Programmable Controller. Programmable controllers are one of the most important and widely-used products in modern industry with automated line applications ranging from automotive to packaging to biotech. The 87-IOSS7 requires a computer and any one of Amatrol’s Mechatronics Learning Systems (87-MS1 – 87-MS7) featuring either the Mechatronics Learning System for Siemens S7-300 (870-MPC-S7313) or the Siemens S7-300 with Profibus (870-S7314). 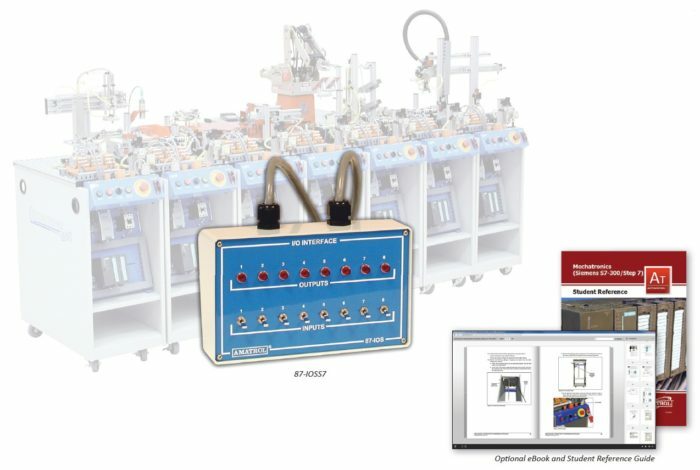 The 87-IOSS7 includes a PLC Simulator Module that allows learners to write and test PLC programs separate from the mechatronics carts. This expansion on Amatrol’s PLC training will cover major topic areas like: basic programming, PLC motor control, PLC timer and counter instructions, event sequencing, application development, program control instructions, and math and data move instructions. This dedication to providing a depth of curriculum topics for both theoretical understanding and hands-on skill practice is why Amatrol is the world’s leader in skills-based, interactive technical learning. The 87-IOSS7’s PLC Simulator Module includes eight indicator lights and eight input switches, as well as a connector set and power cable. When used in conjunction with a computer and a specified Siemens S7 PLC from one of Amatrol’s Mechatronics carts, this simulator module will allow learners to practice a variety of hands-on skills. Some of these skills include: designing a PLC program to operate a reversing motor application; entering and editing a PLC program that uses an on-delay timer coil instruction; designing a reciprocating actuator sequence PLC program; and entering and testing a PLC project that uses OB100 to initialize a project. The PLC Learning System – Siemens S7 curriculum is a comprehensive guide to understanding PLC operation, programming interfaces, programming software, and the basics of ladder logic. Within this richness of knowledge, learners will study topics like: seal-in program logic; pulse timer coil instructions; count up and down instructions; continuous cycle logic; stop functions; project blocks; add, subtract, multiply, and divide instructions; and move instructions. Optionally, this curriculum is available in an online eBook format. This eBook includes all of the content provided in the printed version, but provides an efficient online alternative with enhanced features such as keyword searches and zoom controls that enable a user to quickly locate and view information. The 87-IOSS7 is just one in a large array of PLC options offered by Amatrol. Other Mechatronics options for Siemens PLCs include: Human-Machine Interface (87-HMIS7A); Troubleshooting (87-FTSS7); Barcode (87-BR1S7300); RFID (87-RF1S7300); and Vision Inspection (87-VS1). A sample copy of the Programmable Logic Controller – Siemens S7 Student Reference Guide is also included with the system for your evaluation. Sourced from the system’s multimedia curriculum, the Student Reference Guide takes the entire series’ technical content contained in the learning objectives and combines them into one perfect-bound book.